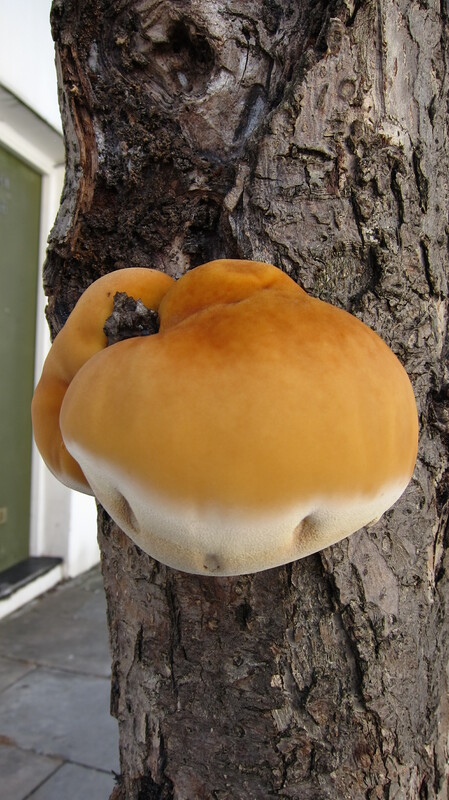 A crab apple tree in Northdown Street last week was sporting this incredible fungus that seemed to be feeding on the sap oozing from the tree. It’s a warm spot and the tree itself was fruiting heavily. I’ve never quite seem anything like it. Does anyone know what it is? And I the only one that can see a little face in there? The fungus has since burst and is now rotting away. This entry was posted in Wildlife and Nature and tagged fungus, Northdown Street. Bookmark the permalink. This looks like a young Ganoderma resinaceum but they are not found on apple trees. The droplets underneath are common on inonotus species so it could also be this. Post a photo as it matures and it will become obvious which species. Having checked my photos of young Ganoderma and Inonotus I now am more sure it is Inonotus hispidus. The consensus from the London Fungus Group is that it is indeed an immature specimen of Inonotus hispidus growing on an unusual host. 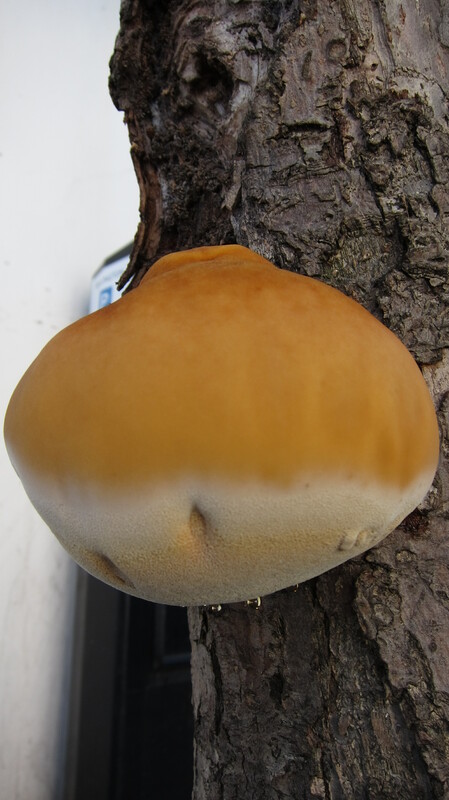 This fungus takes a variety of forms but what betrays its identity are the droplets which are not sap from the tree but moisture from the tree that the fungus draws out as it grows. I will have a look at it when I next go up the street. I’ve got one exactly the same on my apple tree here is Paris, thought it was some sort of space alien, feel better having read your re,arks, thanks guys.